Do you struggle with rest? Do you have a hard time sleeping at night like over 8 million other Americans? You're not alone in your fight to slow down. Not only do we struggle with sleep, we also struggle with rest and not being busy all the time. I for one, can highly relate to this topic of rest and this book. I struggle to in the presence of the Lord and be still. Or to be still in life. I am a doer, not a sitter. The art of slowing down and rest is so important to our relationships and our overall health/ wellness. 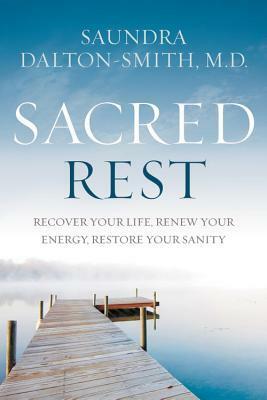 The Sacred Rest is broken up into three sections: Why Rest? The Gifts of Rest and The Promises of Rest. This book hits all areas of rest and will help you find a balance in an unbalanced world. It also has this handy test for you to take too, which helps you assess what area in your life needs rest. I found it to be super helpful. This book is great as it brings huge awareness to your life and helps you create balance. I really loved this book and know a few people who need this book. I will be reading this book again. I give this book 5/5 stars. A favorable review was not required. Dr. Saundra Dalton-Smith is a Board Certified internal medicine physician. She shares with audiences nationwide on the topics of eliminating limiting emotions, correcting work-rest imbalances, and experiencing personal renewal. Dr. Dalton-Smith is a national and international media resource on the mind, body, spirit connection and has been featured in Women's Day, Redbook, First For Women magazine, Focus on the Family, and many other publications. She is the founder of I Choose My Best Life. Her other books include award-winning Set Free to Live Free: Breaking Through the 7 Lies Women Tell Themselves and Come Empty: Pour Out Life's Hurts and Receive God's Healing Love.